SSH on the go. 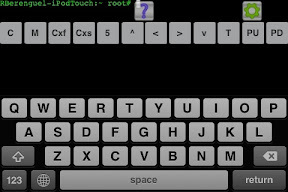 This is what TouchTerm Pro promises, and perfectly delivers for your iPhone and iPod touch terminal enjoyment. I needed some way to connect to my office computer, to check program running, start processes, such things. Before jailbreaking, there was only one option, and anyway, after doing I am using it and don't mind the 7,99€ spent on it. Password blocked, then you can set your passwords to "remember" without fears of unwarranted access. There are also keygen options, but I didn't want the fuss, this was easier. 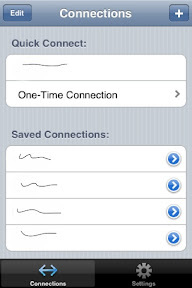 On start (after the entry password) you see the connections list, with the last connection ready to start. You can have... well, at least 4 connections, as I do (iPod's localhost, office, mail server and 8-processor cluster). Here you can see ssh up and running... 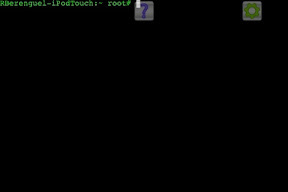 In a local connection with the ssh daemon in my jailbroken iPod. 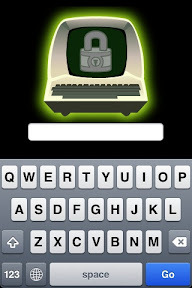 Tap once around the center, and a semitransparent keyboard appears. 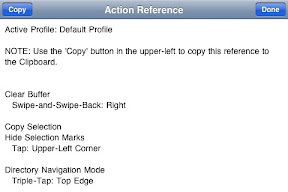 The transparency can be adjusted on the settings menu, and also through a gesture command. You can also bring up several additional programmable keyboards. Here you can see the default for alt keys. Here you can sey a keyboard setting I wrote, along with the low transparency one. Emacs keybindings. You can define either 5 keys keyboards or 12 keys keyboards. This has still room for one more command (in the "5"). You define keys as any combination and then set the name. Cxf stands for C-x C-f, for instance. You can then assign this keyboard to some gesture... along with chains of actions. If I tap twice on the right hand side of the screen, the emacs keyboard appears, along with the standard keyboard. Also when I write emacs and tap intro in any ssh session, this action is repeated, and I am ready to edit. And the help button explains everything in the current gesture profile... Because what sets TouchTerm outside any other such app is gestures: your own and predefined. Swipe with two fingers down-right, the keys turn lighter. Tap right, you have history autocompletion. And more and more commands can be given, and are already defined, as you have seen. A very worthwhile application, albeit a little expensive for my tastes.